For fighter info, see Zelda (SSBM), Zelda (SSBB), Zelda (SSB4), and Zelda (SSBU). "Zelda" redirects here. For the universe, see The Legend of Zelda (universe). Official artwork of Princess Zelda. Princess Zelda (ゼルダ姫, Princess Zelda) is the titular character of The Legend of Zelda series by Nintendo. 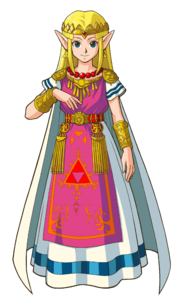 Unlike the majority of Nintendo characters, there are several, distinct incarnations of Princess Zelda seen throughout The Legend of Zelda series. Regardless, most share the same status as the crown princess of Hyrule, the setting for the vast majority of the series. Other hallmarks shared by the various iterations of Zelda are their possession of both inherent magical abilities and the Triforce of Wisdom, although these are not depicted universally. While earlier games depicted Princess Zelda as a damsel-in-distress, a number of modern games have depicted her as an ally, companion, and love interest to the series' protagonist, Link. Zelda made her Super Smash Bros. debut in Super Smash Bros. Melee, and has been a playable character in every installment since. Princess Zelda's first appearance was in The Legend of Zelda on the NES, where she served as the damsel-in-distress for Link to rescue from the evil monster known as Ganon. Within the series' chronology, however, Zelda makes her first appearance in The Legend of Zelda: Skyward Sword; this game is notably the only one where Zelda is not a princess, due to Hyrule's royalty having yet to be established during the game's events. Instead, she is the goddess Hylia reborn as a mortal, who chooses her childhood friend Link as her hero like Hylia did with her own chosen hero. Zelda has appeared in some capacity in every installment of The Legend of Zelda series, with the exception of Link's Awakening, where she is only mentioned briefly, and Tri Force Heroes, where she is referenced via an outfit. While she has typically assumed this role in subsequent games, modern depictions of Zelda have seen her assume an active role in Link's final battles. Notable examples include The Wind Waker, Twilight Princess, Spirit Tracks and Breath of the Wild. It is worth noting that while there have been multiple games within The Legend of Zelda series, it has not always been the same Princess Zelda who appears in each installment, with this same notion being shared with Link. This is evident by the fact that there are multiple timelines within the series, wherein many games typically feature a new Zelda. By extension, Zelda's age has varied across the series: she appears as a young girl in some games, and as a teenager or young adult in others. Ocarina of Time notably featured Zelda being portrayed as both a child and an adult in the same game. Zelda is often depicted as a classically beautiful princess who sports long, blonde hair, blue eyes and pointy ears, the latter of which is typical of Hylians. However, her hair and eye color are not universally consistent, as shown in The Legend of Zelda, The Adventure of Link, Twilight Princess, and Breath of the Wild. On a more exaggerated note, many games that use the "Toon" design popularized by The Wind Waker feature Zelda with cartoonish anatomy; most notably, her "Toon" design features large eyes with blue irises (black prior to Spirit Tracks). 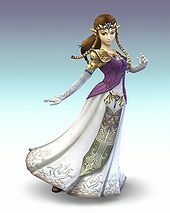 Zelda's dress is often portrayed as having elaborate designs, and is predominantly colored pink or purple alongside white and occasionally gold. However, she also wears a simple blue dress in A Link to the Past; white, robe-like dresses in Skyward Sword and Breath of the Wild; and a blue tunic with black pants combination as well as a dark blue dress with gold trim in Breath of the Wild. Her footwear varies between heels (Ocarina of Time), boots (Twilight Princess and Breath of the Wild), and sandals (A Link to the Past/A Link Between Worlds, Skyward Sword, and Breath of the Wild). Zelda is also occasionally seen wearing a cape, as shown in A Link to the Past and A Link Between Worlds. Zelda's first playable appearance occurred in the non-canonical Philips CD-i The Legend of Zelda games, which are infamous for their poor quality. Her first playable appearance in an official Nintendo game was Super Smash Bros. Melee, while The Legend of Zelda: Spirit Tracks marked her her first playable appearance within her home series. While Zelda herself makes no appearances in Super Smash Bros., she is nevertheless referenced, due to The Legend of Zelda, The Legend of Zelda: A Link to the Past, and The Legend of Zelda: Ocarina of Time being mentioned. Zelda, as she appears in Super Smash Bros. Melee. The adult version of Zelda's incarnation from Ocarina of Time appears as a playable character in Super Smash Bros. Melee. However, due to the GameCube's improved graphics, Zelda's design in this game is far more detailed than in Ocarina of Time, although very inaccurate as she is portrayed here as wearing heels instead of boots like in the game her design is based on (this is best seen when one looks underneath her dress while comparing her different trophy forms). Like her fellow series representatives Link and Ganondorf, Zelda is a slow, but powerful character. However, she deviates from them by being a lightweight whose moveset almost entirely consists of magical attacks, three of which are based on spells used by Link in Ocarina of Time. Her neutral special move is Nayru's Love, which emits a crystalline barrier that deals damage and offers protection. Her side special move is Din's Fire, which launches a magical fireball at her opponents. Lastly, her up special move is Farore's Wind, which teleports her in a desired direction. Zelda also has the distinction of being the only character who can become an entirely different character. In this case, she can use her down special move, Transform, to assume her alter ego from Ocarina of Time, Sheik, who boasts a drastically different playstyle in comparison. Despite the power and versatility of her magical attacks, Zelda is hindered by her poor mobility and overly demanding, situational playstyle. As such, she is ranked 22nd out of 26 on the tier list, which places her in the F tier and renders her a low-tier character. Zelda is a playable character, so she is featured on three trophies that can be acquired by beating each major 1-player mode with her on any difficulty. Her first trophy is earned by defeating Classic Mode as her on any difficulty, her second is from Adventure Mode, and her third is from All-Star Mode. Zelda, as she appears in Super Smash Bros. Brawl. Unlike Melee, Super Smash Bros. Brawl does not feature the Zelda from Ocarina of Time. Instead, she has been succeeded by her descendant, the Zelda from The Legend of Zelda: Twilight Princess. While this Zelda's playstyle is essentially the same as her ancestor's, she nonetheless sports a few differences. The most noticeable of these are her appearance as "Zelda/Sheik" on the character selection screen, which allows her starting form to be chosen, and her possession of a Final Smash called Light Arrow, which can pierce multiple opponents and boasts enough power to one-hit KO the first opponent it hits. Even though this Zelda's attacks are much stronger, she shares the same significant weaknesses as her ancestor, which are further compounded by Brawl's changes to gameplay physics. Due to her weaknesses largely outweighing her strengths, Zelda is ranked 37th out of 38 on the Brawl tier list. This places her in the F tier, and renders her as a bottom-tier character. The princess of Hyrule. In other games, her role changes between titles. In Ocarina of Time, she was hunted by the would-be conqueror, Ganondorf. She deceived him, however, by adopting the persona of Sheik. In Twilight Princess, she surrendered to Zant and was held as his prisoner. The princess of Hyrule, loved and trusted by the people. When Hyrule is invaded by Zant from the Twilight Realm, Zelda is resolute in opposing him...but she chooses to protect her people and must surrender. From then on, she is imprisoned in the Twilight Hyrule Castle. In memory of the lost people of Hyrule, Zelda wears a black robe of mourning. The rightful successor of the throne and descendant of the true royal bloodline of Hyrule. She strove to put an end to the ongoing battles with Ganondorf. As the bearer of the Triforce of Wisdom, she became a target of the resurrected Ganondorf. Although she was hidden in Hyrule Castle, Ganondorf managed to find and kidnap her. Zelda, as she appears in Super Smash Bros. 4. The Twilight Princess incarnation of Zelda reappears as a playable character in Super Smash Bros. 4. However, her overall color scheme is noticeably more vibrant because of SSB4's aesthetics. Despite being a bottom-tier character in Brawl, Zelda received a mix of buffs and nerfs in the transition to SSB4. The most noticeable nerf is her separation from Sheik, who is now an entirely separate character. This nerf is further compounded both by the drastic buffs Sheik received in her own transition to SSB4, and Zelda's key flaws not being properly addressed. However, the buffs Zelda received are quite noticeable: her damage racking potential has improved, Farore's Wind is now a very potent KOing option, and she received a new down special called Phantom Slash that has utility as both an offensive and defensive attack. In addition to these inherent buffs, Zelda received numerous buffs via game updates. These include increased damage outputs, improved multiple hit connectivity, decreased ending lag, and the removal of Phantom Slash's blind spot. The changes to shield mechanics also indirectly buffed her multiple hit moves and Lightning Kicks by making them safer on shield, and making her better at avoiding punishment. Although Zelda's strengths are largely outweighed by her weaknesses, she has nevertheless become slightly better than she was in Brawl. As such, Zelda is currently ranked 53rd out of 55 on the SSB4 tier list, placing her in the G tier (being tied with Ganondorf). In addition to being marginally better than her ranking in Brawl, SSB4's removal of the bottom-tier as of its third tier list also results in Zelda being assessed as a low-tier character like her ancestor is in Melee, rather than as a bottom-tier character like she was in Brawl. A Zelda wig is also available as a headgear for all Mii Fighter types. 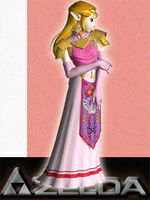 Princess Zelda plays a variety of roles throughout the games bearing her name. In the Wind Waker, she's a pirate who travels the seas without knowing her true identity. Even when she learns she's a princess, she quickly returns to her piratey ways. In the end, she takes up a bow to fight beside Link. When a dark shadow invades Hyrule, Zelda sacrifices herself and is imprisoned in the world of Twilight. Her dark attire while a prisoner is appropriate to the title of the game, but Link's bravery convinces her to toss the robes and take up her bow and arrows instead. Zelda, as she appears in Super Smash Bros. Ultimate. For the first time since Brawl, Super Smash Bros. Ultimate features a new incarnation of Zelda as a playable character. Unlike her predecessors, this Zelda is an unlockable character and, more notably, not based on a single incarnation. Instead, this Zelda features a combination of design elements from her incarnation in The Legend of Zelda: A Link to the Past, and that respective incarnation's descendant in The Legend of Zelda: A Link Between Worlds. In addition to a complete redesign, Zelda received a new Final Smash, Triforce of Wisdom. In addition to a visual redesign, Zelda has been significantly buffed in Ultimate. Many of Zelda’s moves have reduced startup and endlag and improved KO potential. Her neutral attack, which was previously one of the slowest in the game, comes out significantly faster, and has been reworked into an infinite with KO potential. Her dash attack and up throw are much stronger, allowing Zelda to more easily secure KOs. When Zelda's Ultimate design was demonstrated during the game's E3 2018 trailer, the Japanese version said she that she is the incarnation from A Link to the Past. Conversely, the English version, as well as the official website's English blog post focusing on Zelda, said she is the incarnation from A Link Between Worlds. To further complicate matters, Zelda's Classic Mode Spirit uses official artwork from A Link Between Worlds, yet the English version of Palutena's Guidance regarding her in Ultimate contradicts both the English E3 trailer and blog post by stating that she is the incarnation from A Link to the Past. This discrepancy was finally settled by Masahiro Sakurai during a Nintendo DREAMS Magazine interview, in which he stated that Zelda's design in Ultimate is indeed a combination from both games. Due to A Link to the Past portraying her in-game sprite with brunette hair and a blue dress, in contrast to her appearance in the game's artwork, it is possible that this was the main reason as to why she is mostly referred to resemble her A Link Between Worlds incarnation. Zelda is one of two characters in the Super Smash Bros. series to be portrayed by a different incarnation of that character throughout the franchise, with the other being Link. Her Ocarina of Time incarnation appears in Melee, her Twilight Princess incarnation appears in Brawl and SSB4, and an incarnation featuring design elements from both A Link to the Past and A Link Between Worlds appears in Ultimate. Her Twilight Princess incarnation is the only one to appear in more than one game. Prior to Ultimate, Kirby's Zelda hat depicts him wearing the wimple her Ocarina of Time incarnation wears during her childhood, despite being based on her adult design in Melee. This was changed in Ultimate, as his Zelda hat now resembles Zelda's hair in A Link to the Past and A Link Between Worlds. Skyward Sword and Breath of the Wild, ironically enough, are the only non-"Toon" 3D console games whose incarnations are not directly represented by Zelda herself in the Super Smash Bros. series. 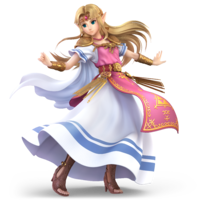 Zelda's design in Ultimate is the only incarnation of any The Legend of Zelda character to originate from either a non-3D game or a handheld game to be directly represented in the Super Smash Bros. series. 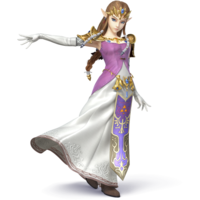 Zelda is the only playable character in the Super Smash Bros. series to sport an alternate costume that would inspire her default design in a subsequent game. In this case, SSB4 reuses her Twilight Princess incarnation from Brawl, yet gives an alternate costume based on her incarnations in A Link to the Past and A Link Between Worlds, which would become her default design in Ultimate. Conversely, her Twilight Princess incarnation becomes the basis for an alternate costume in Ultimate. Zelda has the highest amount of enhanceable spirits out of all playable characters, with a total of 3. This page was last edited on April 10, 2019, at 11:41.